When you’re considering which flooring to choose for your home, there are several things to think about, including durability, practicality, and of course how good it looks. If you’re wanting a floor which is visually appealing, is easy to clean, and will stand up to heavy footfall, then laminate flooring could be an ideal solution. One of the major benefits of laminate flooring is that it’s very durable, and this is mainly down to how it is constructed. Laminate is typically made up of four different layers; the stabilizing layer, core, decorative or image and wearlayer. The first to these is the very bottom of the flooring, which provides a protective barrier between the subfloor and the coreboard, which creates equality on either side of the plank ensuring there is no unnecessary movement within the board. The core layer compromises of High Density Fibreboard, which is made of highly compacted wood fibres and resins which support the weight of the people who walk over it. The image layer is exactly that – the layer on which the image is printed, which gives the laminate that real wood look. Finally, the wear layer is made of cellulose paper which is saturated with a melamine plastic resin. This protects the flooring from fading, wear and tear and stains. Unlike real wood flooring, laminate is also waterproof, making it a better solution for kitchens, utility rooms and bathrooms. Laminate flooring is available in a range of different styles, including those which replicate various species of wood, from oak to walnut and everything in between. Many laminate options also come with a textured grain effect and embossed patterns, which make them almost indistinguishable to the genuine article. Another advantage to laminate flooring is that it is easy to clean and maintain. Regular sweeping and wet mopping will keep your laminate in top condition and ensure that it lasts for as long as possible. It’s no surprise that laminate is considerably cheaper than it’s real wood alternatives, which makes it an ideal option if you are looking to redecorate on a budget. Even if the purse strings are tight, laying a laminate floor can give your home a fresh new look, and can improve its appeal on the housing market when you’re ready to move on. Make sure your area is prepped before you begin. Level a wall with patches of of thin set adhesive if you need to. Scrape off loose paper or paint, or lightly sand glossy walls. Remove outlet plates and switches before you begin. The wall should be clean and dry before you get started. Getting your measurements right the first time around will save you a lot of hassle. You don’t want to have to start something all over again! Measure carefully around your windows, corners, and outlets before you begin. You need to plan your wall with the pattern you want before you start. You should try to avoid awkward slivers of tile along the wall if you can. Practice dry laying the tiles on the floor to get an idea of what you want it to look like. You should also do this if you’re retiling the floor. Use spacers in your layout to get an accurate idea of what it’ll look like. Continue to reposition your tiles until you find the best lay out. It’s now time to mark your layout on the wall. Sometimes the edge of the floor can be crooked, so use a level as your guide. Mix up your thinset with the instructions, ideally it shouldn’t be too wet or too dry – the consistency of peanut butter is perfect. Your tiles won’t stick properly if it’s too dry, or they will droop if it’s too wet. Only use as much adhesive on the wall as you can apply tiles to in 5-10 minutes. Some thinset dries really quickly. Creating grooves in your thinset with a trowel will remove excess adhesive, and will keep the tile stuck to the wall more effectively thanks to the suction. Double check all tiles to ensure they are level. Remember that it’s better to clean off excess thinset when it’s wet with a screwdriver and sponge than to chip it off later. Once your adhesive gets too thick and dry, make sure you make a new batch. If you just add more water it won’t be as sticky as it should be. One batch may only last 30 minutes! Really wiggle and press your tile onto the adhesive to ensure it’s stuck too. The thinset must then be left to cure for 24 hours, so no showering. 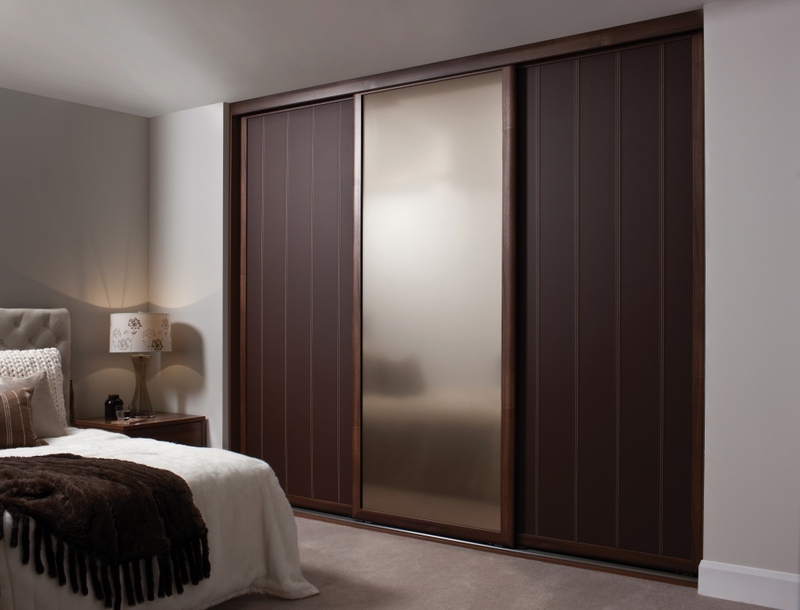 Wardrobe design is extremely important for any bedroom. In many bedrooms it even has bigger surface than all other furnitures together. But when the bugdet is limited is it possible to have a nice modern wardrobe? It is allways possible to have a good result with a simple and cheap design. Of course it is! The first point is to suit well with the rest of the bedroom. The other point is to choose the right colors! 2 pieces of same wood and 2 pieces of different wood can cost the same but have very different result. Generally use the same flat wood for the whole surface will look boring, simple and cheap. 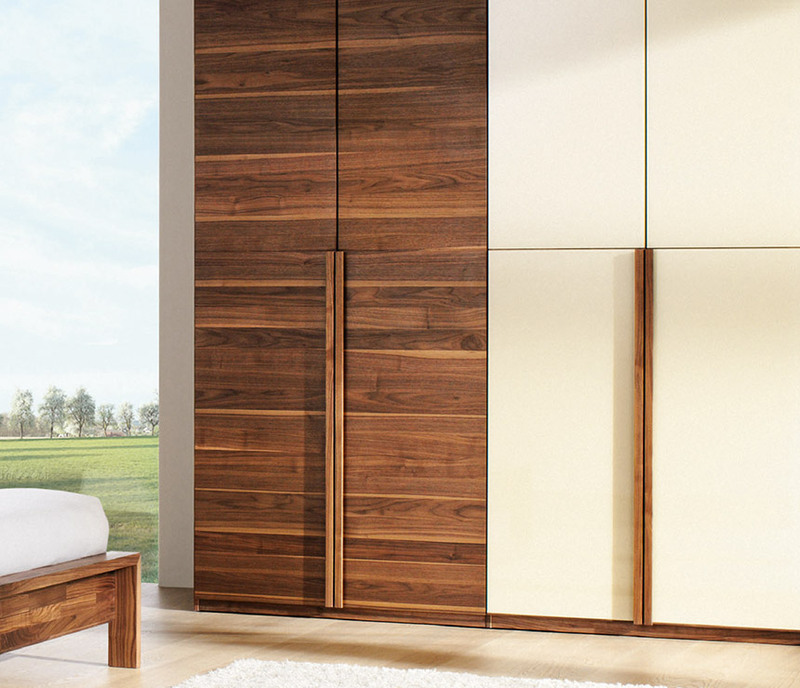 In classic wardrobes that doors and frames are not flat might look fine, but not so much in simple non expensive wardrobes made by flat melamine for example. But let’s better see live examples of some wondeful simple wardrobes. A beautiful combination of Walnut and beague Melamine. White color and mirror with silver frame. White, silver and mirror are all neautral and easy to combine! When have 3 doors, the mirror or the light color looks better in the middle. One more beautiful modern wardrobe. A very good example of a typical wardrobe that gets a modern and special style just by changing color of the middle doors without increase the cost. Kentia Palm. One of the most beautiful houseplants. Kentia Palm is an exotic plant that I would really recommend for a modern living room. It is one of the most beautiful plants for interior decoration. In height can surpass 2 meters. Due to the slow growth can be left in the same pot for several years (3-5 years) without having transplanting. Some time the soil is dry, lift the plant from the pot, if the ball of soil appears to consist mainly of roots than soil, it is the moment to change pot. It grows in bright places but without direct contact with the sun, because that can burn the leaves. If a point is very bright it will grow fast and will have a more compact shape. The ideal orientation regarding lighting, is near a northern or eastern window. Not withstanding the cold currents, very low temperatures and generally frost. Avoid letting the leaves lean in windows when the temperature outside is very low. The soil should be light, contain perlite to retain moisture and has good drainage. Lubrication from March to early October will help a lot in the development of kendo. Kentia Palm usually attacked by spider mites and scale insects. Always clean the leaves with warm water to reduce the chances of infection. To eliminate the disease (if found) Spray with special preparation to be procured. An other really beautiful houseplant that is very strong and does not require special care. It is also called money tree and it is considered to bring good luck and money, one of the most popular plants in Feng-Shui. Pachira can adapt very well in different conditions, generally needs light, just avoid direct sunlight during hot Summer days. An other exotic style houseplant is Dracaena Marginata. It is really popular, as it is cheap, strong and beautiful. Can be found anywhere and it worths having one in the house or at the balcony. Dieffenbachia is an other popular indoor plant. In most cases we meet it in small sizes but can also grow and become even more impressive. Main characteristic is the big leaves. These are my suggestions. An other thing we should pay special attention is the pot. Choose a beautiful pot that is combined to the rest of the house. If you are confused the most easy sollution is a white pot. The birth of a child allways creates the need to redecorate the bedroom. Even if you have prepared a room for the baby, the first months, be sure that you will need to have it at your side if not allways, very often. So it is good to create a comfortable environment for you and your baby in the main bedroom , so that your daily life is as easy as possible. Bedroom decor : above all safety. The first concern for bedroom decor should be safety. Remove or move to other rooms heavy and fragile items such as vases or particular projects. Store the iron and cover sharp edges with fabric. The main thing is that you can move freely around the room and have enough space. Pay special attention to hanging objects and fixtures – chandeliers which would suggest to replace even for a few months with conventional , to avoid any possible accident. Still , do not stick phosphorescent stickers on ceiling and remove mirrors from the room. Infants during the first months of life have a special relationship with light and would be good not to disturb . Finally , planters and flowers should be moved anyway in another room or on the balcony and the same should be doing and for electrical appliances such as TV , which even in stand by position emits energy that disturbs the sleep of your baby. Bedroom decor : the essentials. You should also think about specific furniture that will facilitate your daily life . An armchair to sit comfortably near the baby’s bed which will be convinient for feeding and lulling. It is also necessary to have drawers with special surface so you can change dipers to the baby. There you can have all the necessities for the child so you do not need in the night to go from room to room for the basics. Bedroom decor : furniture positions . Special attention should be paid to furniture placement . The decoration of the bedroom , the priority now is to calm your baby. A baby cot would be good not to be located under the main light or next to library, and also keep distance from the heater or air conditioner. Keep also a safe distance from the window , especially not to disturb the morning sunlight child’s sleep . Around the bed should be space for baby and for you to move yourself freely. Remember however that the bedroom decor for new parents should not be done in stress as this can lead to carelessness . Give priority to safety , comfort and functionality and that helps you in your everyday life . Of course your bedroom might not be big enough in order to be able to follow all we have said. Then you should think and try what is more important for you and find the best sollution. Natural wood combined with monochrome surfaces can look really amazing. There are many options to do that in the interior. For example, you can find furniture with natural wood base, and single color doors. You can also insert simple solid wood furniture near monochrome walls. You can even combine different furniture. There are actually limitless options available and many of them are very beautiful. COmbing natural wood with multicolor objects and surfaces is not so good because it gets tiring for the eye. clear and clean single colors offer a a great and modern sense. You can also use live and intensive colors, and the result can be really amazing. Check if you want the images below some ideas about these mixes that you can apply in your interior design. Dark wood can be combined with light colors like white, beuge, pink and light blue. Creating custom decor objects for your home using simple materials does not always need brilliant talent and skills. Any amatuer having some enthusiasm, patience and imagination can create something beautiful, stylist and special that will change the image of your personal space and your mood. The adhesive tape or washi tapes (as they are called officially in the dens of craftsmanship) is a great material for quick but entirely impressive interior change, undeniably low budget option, both ephemeral and permanent, for temporal or permanant decoration. Moreover, the patterns can be installed on any surface. WIshi tapes are also ideal for children room’s as the kids can play make the room as they like it in order to play and make the atmosphere more pleasant and playful, and furthermore they can be removed easily anytime you want. Decorative washi tapes can be found in bookstores and shops with handicrafts, even at super markets. And of course there is allways the sollution of amazon and ebay where you can find anything. 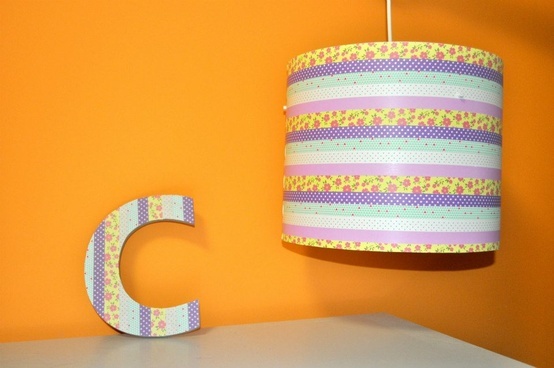 Let’s see some options of different decor objects you can do using washi tape. There are plenty of options for the children’s room, the kids can love it. A Simple linear addition with washi tape can make your bedroom more modern and colorful. We’ve recently covered amazing bathrooms, where British folk spend a surprising percentage of their lives. But that time pales into insignificance when compared to the decades we spend in bed – generally speaking, we spend about a third of our lives asleep. These are some of the most amazing bedrooms in the world, along with some tips on how to bring some fresh style to your inner sanctum. A four-poster bed is one of the easiest ways to instantly turn an ordinary bedroom into something romantic and luxurious. Dark wood such as mahogany or a deep varnish creates a stately impression, particularly when teamed with other period pieces of furniture, such as a dressing table with a table-top mirror and matching chair. Exposed wooden floorboards and a sheepskin rug complete the sense of luxury. Creating this effect in your own home can be difficult, as a lot of four-posters would take up the majority of the space of an ordinary bedroom and could be too imposing. There are modern four-posters that are made with lighter materials that can work, and some newer designs are four-poster without the curtains. The side-less box gives the same feeling of grandeur without darkening the room. You don’t need a four poster for a bedroom to exude wealth and glamour. This bedroom (set up for display at the Governor’s Mansion State Historic Park in California) is a perfect example of that. A red chaise longue and ornate mirrors, lamps and curtains combine to create a regal effect in the room, as does the fireplace and red carpet. In larger rooms there may be space for an armchair or chaise longue, but failing that, a cushioned bench at the end of the bed will go some way to transforming the room, as will patterned wallpaper. Try to keep the carpet and wall in contrast with one another – either a deep-coloured carpet and pale wall, or vice versa. Adding a throw and plump cushions to the bed (if you can be bothered to arrange them each morning) will contribute to the style. If you have a large and unwieldy space (such as a loft or chapel conversion) then this might be the solution to your bedroom needs. Providing an element of privacy and separation while not physically dividing the space with walls, a split-level room maximises the potential of both bedroom and living areas. Not all houses will be suitable for this sort of layout, but a surprising number of homes can be modified to this open-plan format. Converting a loft could provide a surprising amount of space between the floor and the roof, and there is no need to elevate the bed level as high as shown in the image. Just one step up would still add something a little special to the room. Do you really, really like the forest? The owner of this room clearly does, and has decided to express that with a bright (and perhaps rather garish) mural. It is an interesting addition to a room, and can actually add depth in contrast with a bland wall. One would certainly never tire of looking at it, but if they did it can always be painted over fairly easily. If you are interested in adding your own mural to a wall, there would be scope for a more modern design. Silhouette murals can look very elegant, and are not quite as intrusive as the bright colours of this design. When deciding on what to paint, considering how the furniture would be laid out in relation to it may help. Placing the bed in the centre of the room with the headboard end against the mural may inspire a symmetrical design, or at least something that has the bed as its focus. Often the preserve of studio flats, combining bathrooms with kitchens with bedrooms can present a a few challenges. But when it’s done tastefully (such as in the photo above) it can make for a vibrant and decadent living space. Studios often try to hide away the part of the room that shouldn’t be there, but turning it into a prominent feature makes it seem intentional and can look fantastic. Even with limited space, don’t tuck anything into the corners to create this effect. Choose a good quality bath that has aesthetic appeal – stone as in the picture above or a classic clawfoot bath that looks good as a stand-alone piece. Placing it in the centre of the room with some candles around it will make it a feature rather than an obstacle. This traditional Icelandic bedroom is a relic from a bygone era, but the design principles are sound. The two bunks here would make this an ideal children’s room, and the shape lends itself to attic conversions. It’s rustic, cosy, and is enough to make any youngster feel adventurous. Building your own version of this would be a large task but taking certain elements – the boards, the wooden bunks and the fur on the chair are all relatively cheap additions to your existing theme. For a double room, place the bed in the centre and use the space at the edge of the room for some low, built-in cupboards that could be adorned with cosy blankets and cushions, or even low bookshelves. Most people will remember being so obsessed with something that they wanted their whole bedroom to show that. At the point that your child wants their room to be themed, there is very little point in arguing or trying to keep it conservative, so you may as well just go all out. Anyway, the themed room shown above would surely be any Arsenal fan’s dream! No doubt the fan in question will have their own ideas, but buying all the merchandise is very expensive. If you don’t want to buy everything available, focus on the big elements – the wallpaper and the duvet set, and then throw in one small thing at the end, such as the teddy bear or scarf that they can carry around with them. Just don’t be surprised when they want to change it again a year later. The intense grey of this bedroom contrasts with the small elements of light to highlight them. There is a functional element to the room that is quite refreshing, with the sharp corners and neat lines. Meanwhile, the softness of the shaggy cushion and the curved end of the desk and the vase provide the comfort that no bedroom should be without. Be careful when choosing to attempt this effect; grey can be very gloomy if it is too dark and can look washed out if it is too pale. Taking different tones of the grey, such as that of the lampshade in the image and the metallic of the chair, gives depth to the room and coordinates it without making it too industrial. An eclectic mix of cultural influences in this bedroom has been used to brilliant effect. The bright, thin curtains at the windows either side of the bed, the wooden four-poster and the bright, oriental quilt bring a feeling of paradise to the room that could be achieved anywhere (as long as the sun shines at some point). The temptation with a bohemian style is to gather lots of trinkets, colourful throws and hanging beads, all of which can look brilliant but can be quite tacky. Select the items carefully and don’t get carried away, but do have fun with it – bohemian is all about interesting pieces found in interesting places. It’s not to everybody’s taste, but some find a minimalist design to be very peaceful and a good escape from the stresses of everyday life. The less clutter in the room, the better the night’s sleep. Straight lines and symmetry – or carefully calculated asymmetry – are key to the striking impact of this design. Even the curved bulbs have been hidden with boxed lampshades and everything is perfectly aligned. Creating this in your own home is very simple; a light colour on the wall and floor will ensure the room stays light and airy, with nothing on the wall to detract from the minimalism. Low furniture minimises space under beds for any dust or shoes to gather. With so many horizontal lines, the occasional, thin vertical line, as shown by the lamp in the photo, brings the room together and looks fantastic against neat, horizontal blinds. Under-floor heating may be a good idea, as rugs and carpets could impact the effect. What do you think of these bedrooms? Are you suitably amazed, or do you find the designs here underwhelming? Let us know what your perfect bedroom would contain, and share some examples of brilliant boudoirs in the comment section below. This article was written by Michael Palmer, a freelance writer and interior design enthusiast writing on behalf of More Th>n home insurance. We spend a phenomenal amount of time in the bathroom. With both men and women using the loo for more than 18 months of their lives, you’d think the bathroom would be a very special part of the home. That’s rarely the case, though. Too many bathrooms are a slightly apologetic collection of cheap fittings, plastic bath tubs and underpowered showers. That’s why we’ve put together this list of stunning bathrooms which, while mainly out of reach to all but the very rich, might provide inspiration for those wishing to improve the most neglected room in the house. It might not be to everybody’s taste, but this is a great example of a bathroom that makes full use of the outside world. Combining privacy with serenity, this bathroom offers a sense of emancipation from indoor life (and the stresses that go with it). Build on this theme by capitalising on any garden space you have. While the outdoor shower might not be a practical choice for the British climate (this particular bathroom is in the Seychelles) there’s still scope to bridge the gap between indoors and outdoors by maximising the effect of the windows. These organic, natural colours create a robust aesthetic for a bathroom. The marbled walls are a particularly strong design choice, reflecting some of nature’s most beautiful patterns while conjuring up a sense of decadence and majesty. The bath (reminiscent of the classic ball-and-claw iron baths) is deep and wide. The effect of this design can be achieved in any bathroom, regardless of the size or shape. Using dark and imposing tiles on one wall can be striking, and the contrast of bold materials with lighter colours and smoother shapes will contribute to the overall effect. Opting for small wall light fittings can create a gentle and relaxing atmosphere, particularly if any alcoves are lit (as shown in the image). Built-in storage cupboards under the sink, for example, will ensure the sleek appearance is maintained. This design is strikingly different to most bathroom designs in that it relies upon angular shapes rather than more traditional curves. The square lavatory is unusual but combined with the rectangular bath and the imposing black void of the old fireplace, it adds to a memorable ensemble. The square windows gently illuminate this modest but impeccably-designed bathroom. Creating the cubic effect in your own bathroom is simple: keep everything minimal and choose sharp edges rather than curved on all units. Use the same colour for everything – preferably white – and then contrast it with the odd, angular element of black, and maybe indulge in a round feature like the shower head in this photo. This is another bathroom which breaks the mould – rather than dull whites, beiges, greys and browns, this room is a gaudy cocktail of turquoises and shiny copper. The copper bath is a massive statement and suggests to guests that the bathroom has been taken seriously. The copper bath adds a huge amount of character to the bathroom, and if you can’t get hold of one then other pieces found in vintage furniture stores can have a similar impact. Add to the statement piece – whether it is the unique bath or an interesting mirror – with fun, bold colours and keep your eyes peeled for quirky items such as odd shower fittings and stained glass windows. Offering another more cubic design, this serene bathroom immediately instils a sense of calm. Everything from the pastel colours to the delicate flowers makes this bathroom peaceful (in stark contrast to the turquoise-tiled one above). The generous French windows provide a sense of openness and plenty of natural light for a calm and refreshing atmosphere. Creating the impression of a modern sauna in your own home can be relatively simple. Selecting units and walls of a sleek wood and opting for large, plain tiles will allow for minimal fuss and clutter. Similarly, an elegant vase with a simple plant such as an orchid (something without leaves, branches or petals that could fall) will add a soft touch while maintaining the clean appearance. Use what natural light there is, or install a number of small lights and a large mirror. The floor-to-ceiling windows in this bathroom create a breath-taking effect. They flood the room with sunlight and offer panoramic views as an alternative to a tiled wall – this is a great example of how to harness the outdoor world and bring the best bits inside. Just visible is a small area of decking outside the shower – perfect. Keep the units towards the outer edges of the bathroom to make the tiled floor itself a feature, perhaps with a luxurious and light bathmat. If there isn’t much space in the bathroom, keeping the sink off the floor will create more, as will keeping the colours light and adding mirrors to reflect the light that there is. Use the windows either by not having curtains or blinds, or by adding a very neat, simple blind that is compact and the same colour as the walls. This bathroom showcases some classic features of bathroom design – the mobile screen, the pedestal sink, the soaring full-height windows and the ball-and-claw bath all come together (on the marvellous chessboard floor) to form a pleasant smorgasbord of English architectural eras. You don’t need an old house to accomplish this very English set of styles. Invest in high-quality fixtures and fittings, and most importantly buy a full-sized metal bath. These baths (which can run into the thousands of pounds, so consider buying second hand or from a reclamation yard) are wonderful things to relax in, so it’s not just an aesthetic decision. Making use of small spaces comes with its own set of issues and opportunities. This wet room style bathroom is a great example of how to make it work – an airy colour scheme with carefully-planned splashes of colour. This attic space is not entirely unlike the void found in millions of homes across the United Kingdom. By using bathroom paint and a similar approach to colour, you could easily install this type of bathroom as an en-suite in your home. Of all the bathrooms on the list, this one is the most feasible on a tight budget. 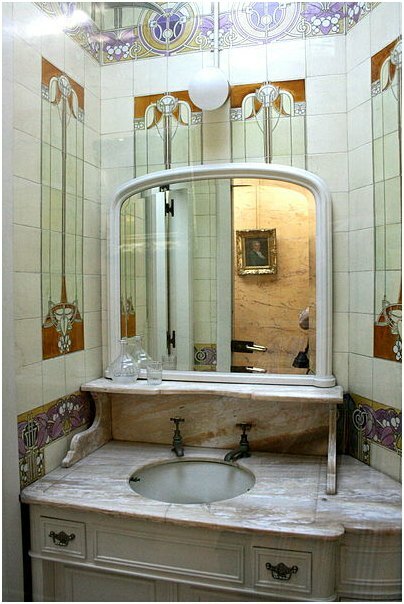 This unusual bathroom design can be found in the Musées d’Extrême-Orient in Brussels. The tile designs are exquisite and the marble sink surround is like the surface of a distant planet. What makes this room feel truly stand-out is the seemingly omnipresent light which originates from well above head height. This is a hard design to emulate. That said, Oriental-style tiles are relatively easy to come across, both new and second-hand. The taps might seem a small detail, but a set of metal fittings can really make a difference. This room builds on the theme of space by emphasising floor area. The chunky shelves on both sides of the room appear to float, making the space feel much larger than if there were conventional cupboard units. The end wall brings a huge amount of light into the room and the candles (a popular part of any bathroom, large or small) turn an already-pleasant space into something special. It’s the wooden floors that really set this room up. Gentle Scandinavian influences can be found in all parts of the room – consider using a uniform wood throughout the bathroom to maximise this effect. Been inspired by this list? Or do you have a bathroom you want to show off? Get in touch using the comment form below, and let us know what you’d have in your perfect bathroom. This article was written by Michael Palmer, a freelance writer and interior design enthusiast writing on behalf of MORE TH>N. These are his own thoughts and do not represent the views of MORE TH>N. Moving into your own home and being faced with the prospect of furnishing a kitchen can evoke panic in many people. Our guide aims to set some of these fears to rest, making the experience more pleasant and enjoyable. We believe the best way to tackle this task is to break the shopping into manageable sections. By purchasing the most important things first, you can settle into your home and buy anything else you need later on. Before you start shopping check what comes with your property as often items like cookers are included, especially if you are renting the property. The items to buy first are the major kitchen appliances of which you will need an oven, a refrigerator freezer and a washing machine. There are many additional appliances you can purchase when you are settled such as a coffee maker, dishwasher, toaster, microwave and blender. However, the need for many of these items depends on whether you personally use and need them. The best way to decide on which appliances are right for your needs is to check out consumer recommendations and energy efficiency ratings, as this can save time and money in the future. The ideal energy rating is ‘A’ however, some appliances are available up to a rating of ‘A+++’, which is the most efficient. There are many designs available to suit both your budget and kitchen design, with many features available to suit your cooking style. A cooker is available as a free standing or built in appliance, available in both electric and gas heating formats, or a combination of the two. A useful feature is an automatic programme which can help decide temperatures and cooking times, especially useful if you are new to cooking. Fridge freezers are available in a wide range of capacities, to suit your shopping habits for example, whether you purchase fresh or frozen foods. Some examples include, a 50: 50 divide or larger fridge section with small freezer space below. This appliance is left to run constantly and so an energy efficient model can be very cost effective in the long run. Once appliances have been decided upon it is relatively quick and easy to buy small items such as cooking utensils, additional furniture, smaller appliances and tableware, as they can often be purchased in one shopping trip. TIP FOR GOOD SLEEP:Even a really good mattress, might not be ideal for your body. Try the best mattresses and choose the one you feel more comfortable on.